The right throne is important, this one's ideal. 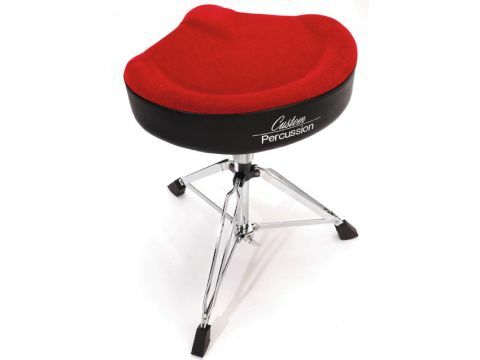 Custom Percussion's D2000 5CR throne bears a lot of similarities to the Roc n Soc line of thrones also carried by BR Distribution, but without the hefty price tag. Featuring a snazzy red velvet triangular cushion that is 90mm deep, it's as comfortable as it looks. The height is adjusted by turning the threaded cushion tube through the lockable socket at the top of the tripod, and the minimum and maximum heights are 52cm and 75cm. The cushion is also available in black.